Your location, theme and budget will help determine what type of decorations to use. Want to go all out or just host a simple tea? You can purchase decorations, hand make them or use a combination. Wow the mom-to-be and the guests with a diaper cake centerpiece. This is a beautiful way to create a focal point and provide a gift at the same time. Order a decorated diaper cake from La Di Da Baby, purchase an undecorated cake and add your own special touch, or make one from scratch. Diaper cakes come in all sizes and styles to match the budget and the theme of the party. A single arrangement on the mantle, next to the sign-in area, on the food serving table or as a centerpiece will enhance the decorations and location for any shower theme. Is the baby shower theme flowers or the mom-to-be a flower lover? Then go wild and use flowers everywhere. Tight budget? Cut flowers from your garden or purchase some nice bouquets from your local Trader Joe�s or Costco. If you have some wiggle room in the budget, then order centerpieces or a show stopper from your local florist. 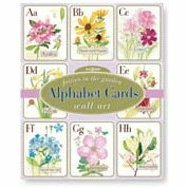 I first saw alphabet wall cards used for decoration at my baby shower. Strategically placed on the outside steps of a curving staircase, the old fashion ABC cards were used to spell out my baby�s name. I loved the affect so much I used it for another shower, this time finding fairy and floral cards that happened to match the shower colors and the baby�s nursery colors. I spelled out the baby�s name over the mantle. The mom and dad loved it so much, after the shower they framed the cards individually and hung them on their baby�s nursery wall. Note this works best for baby names that do not have duplicate letters � if they do, you will have to borrow or buy an additional set to correctly spell the name. It�s a baby shower, right? Incorporate a pretty umbrella into the d�cor and use it either as a centerpiece or upside down in the gift opening area where the mom-to-be can toss the gift ribbons and bows. The cascading ribbons over the open umbrella will make a great picture. Banners, yard signs, door signs and coordinating paper products are available from your local party supply stores, general goods stores such as Target, and of course, from several online retailers. Scatter baby items throughout the location or use them as centerpieces. Use a gift or your existing baby gear to help � a loaned pack and play was used at my shower to hold the gifts and at the entrance door, a little red wagon holding with a stuffed bear was used to great guests. Use decorations that also serve as useful take-home items for the mom-to-be. A diaper cake and wall cards both make a fantastic decoration for the party and serve a purpose at home. Diapers are always needed and the cake topper will be one of the baby�s first toys. 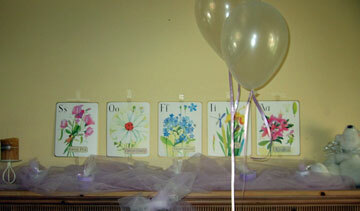 Wall cards may not be used in the nursery but will still become a learning toy for the baby.